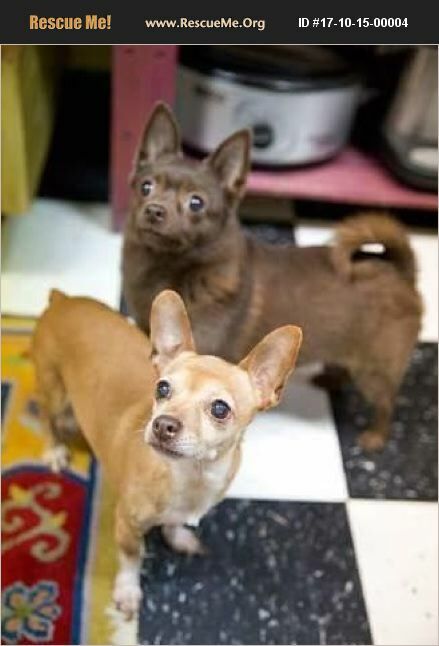 Fiona and Snickers are a bonded pair who must be adopted together. While they are bonded, they sure are the odd couple. Snickers is vocal when strangers approach, she is playful and has the personality of a large breed dog. Snickers loves to play fetch and will play tug of war! Fiona couldn't be more opposite. Fiona is still learning to trust strangers, she doesn't like to be picked up unless she knows you. Fiona is oh so quiet, doesn't make a peep, she prefers to be in a quiet space just handing out in a calm environment. Plus Snickers appears to be a long haired chihuahua and Fiona is a short hair Chihuahua with a nub as a tail. WHAT A FUN AND UNIQUE PAIR! They have been with us for a very, very long time.